When the format shifted from powerful Stage 2s paired with energy acceleration to a game full of huge HP Basic Pokemon with simpler energy acceleration, this deck quickly became the most popular deck in the format. Currently sitting as one of two best decks in the format (as of States 2012), this deck can pack a really quick punch with the attacks of Mewtwo EX, Zekrom BW and Thundurus EP along with a variety of different tech options which the above skeleton list can cater for. Your main strategy is simple, get energy into the discard pile through Junk Arm and Supporters, or through Thundurus’ ‘Disaster Volt’ attack and be able to attach them from the discard pile and onto your benched Pokemon with Eelektrik’s ‘Dynamotor’ Pokemon Ability. This insanely fast stage 1 energy accelerator gives us what Magnezone achieved a format before this, but has become even quicker with the introduction of EXs and more support for big Basic Pokemon. More Thundurus EP: In most, if not all, of your games, this guy is your perfect starter. What it does for you is give you something to attack with on turn one, making sure that you can do a swift 80 damage by the second turn if you have the energy in hand. This gives you a very strong early game pressure you can apply on the opponent, but when you carry on using ‘Disaster Volt’, you are putting Lightning energy into the discard pile, ready to reattach to your backup attacker with ‘Dynamotor’. I’ve seen lists that include from 1 up to the maximum of 4 of this very Pokemon simply because of its lightning fast speed when paired with Pokemon Catcher to slow down your opponent’s set up and the fact that it can set you up for the later game by getting that energy into the discard. N: This card has quickly become the comeback card of the format and for very good reason. When you are suffering from a slow start to your opponent’s very good one, there may be no way for you to win the game if things carry on the way they are, which is where this card comes in. If your opponent is slowing down on resources, but still ahead on prizes enough to squeeze out a win with their current hand, you can play this card and get rid of their winning strategy, putting them down to a really low number of cards. This can seriously mess with an opponent and I’ve seen 3 prize deficits turned into comfortable wins just because of this card. I would definitely recommend filling at least 2 of your spaces for this card as it is so useful in mirror and any other deck that runs thick lines of Mewtwo. Sage’s Training: This deck is a lot about speed, as with the current style of format at the moment, so making sure you have what you need, when you need it is essential. Being able to look at the top 5 cards of your deck, keep two and discard the rest gives you ample opportunity to grab what you need for the next few turns of prize taking and get those energy into the discard pile without having to use Junk Arm or Thundurus’ attack. However, this is a very high risk/high reward card as you can hit a top 5 set of cards that present you with a really tough decision, especially in mirror. You will find situations where you are discarding important Supporters, Trainers and Special Energy that just can’t be recovered, which can hurt your later game a lot. Either go with 2-4 of this card or not at all and stick with the shuffle draw of either PONT or N if you like to keep every option open for the duration of the game. 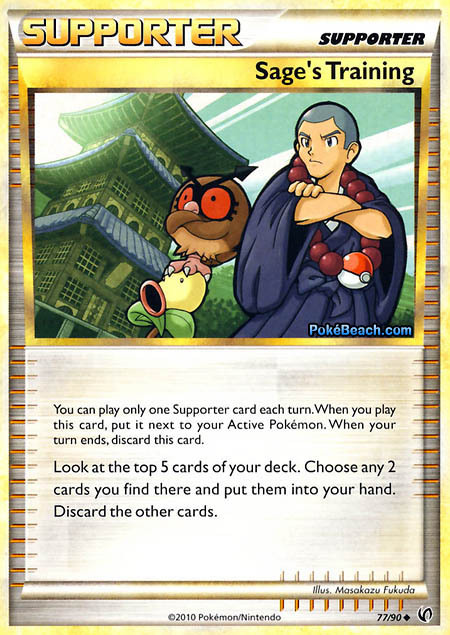 Pokegear: This card is an ultimate consistency booster and is an option for any deck that you have space in. Being able to pluck a Supporter from your top 7 in any situation is going to give you extra options during the game, like choosing between an N or using Pokegear to fish out a possible PONT instead to preserve resources. Not only this, but Pokegear can get you out of very dry spots in the game when all your draw Supporters are staying in the deck. If you have one of your four Junk Arms in hand, you can simply discard two cards in exchange for an already used Pokegear to give you another shot at getting into a game you are falling behind in because of useless hands. Give it a try if you have one or two spaces left. Tornadus EP: With this deck becoming such a popular choice over the past month or so, there has been a significant rise in the amount of decks that just run Fighting types such as Terrakion NV and Landorus NV which can run through this heavily Fighting weak deck in no time. 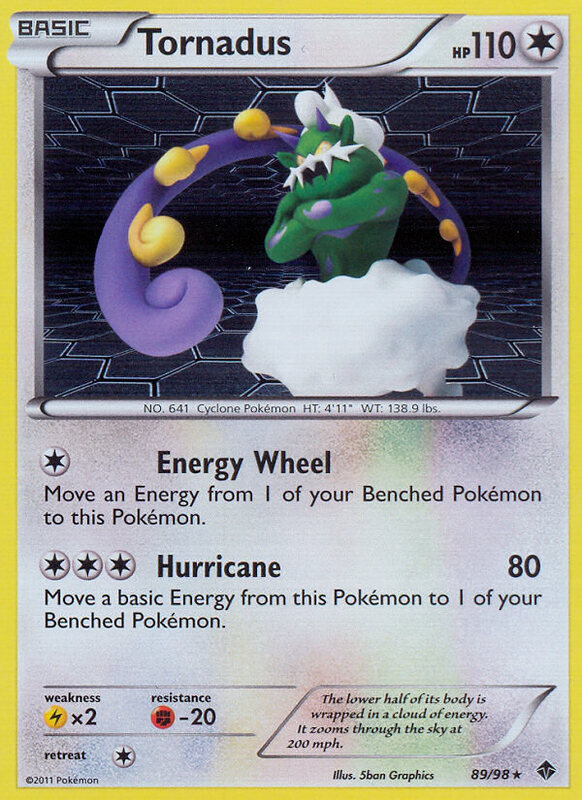 This is what Tornadus is for since it resists Fighting for 20 damage and also has purely Colourless costs for its attacks, perfect for use with your Eelektrik’s ‘Dynamotor’ and the maximum amount of Double Colourless you run. Being able to distribute energy around the board with ‘Hurricane’ also keeps your options open in matchups that aren’t taking advantage of Fighting types, but buys you a little bit more time against those pesky Terrakion when they start hitting the field. Definitely try anything up to 2 in this build to keep Fighting types at bay. This very decklist was shown and analysed in a PokeClass Episode! If you wan’t even more explanation about the deck with further information on how it works, how to build it and more techs you can include, then watch the video below! These pages can only expand with your help. Comment below what you think should be changed or added and we can keep this library growing! do u think this deck will change alot when DARK EXPLORERS come out?? Definitely, but not by a lot. The main two candidates from there are Raikou and Tornadus EX Pokemon-wise. But there are things like Ultra Ball which will start making their way into lists too..
Do u think there will be new decks comin in?? It was founded with NV not ND. Eelectrik was in NV. Will you remake this decklist that will have cards from the new sets with what there purpose is it will be much appreciated. When you use the zekrom ex can you do a strong volt attack with 3 energy cards or do you need 5, because you have to discard 2 plus the 3 you used during the attack?